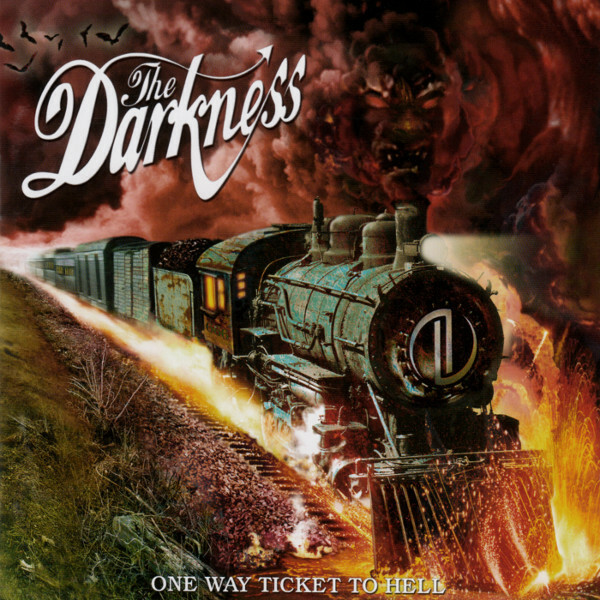 The two years between the Darkness’ debut full-length, Permission to Land, and their recently released follow-up, One Way Ticket To Hell … and Back!, felt like an eternity to me. In case you are not the sleuth I though you were, I am a pretty big Darkness fan. Permission to Landwas one of my favorite releases of the 2000’s. Needless to say, I have been waiting with eagerness for the follow-up. After learning that original bassist Frankie Poullain and the band “parted ways,” there was a bit of skepticism that the band would be able to rock at the magnitude they had reached on Permission to Land. However, after initial spins of One Way Ticket, worries about the level of rock quickly diminished. The band are still able to rock harder than anyone else making music currently in our maybe-too-self-conscious times. The big change from their previous record to this record is that the Darkness have turned down their Thin Lizzy tendencies and turned up their Queen-esque theatrics. One listen to “English Country Garden” or even the lead single, “One Way Ticket To Hell,” and one will be able to notice their move from arena-metal to a more theatrical hard rock. The Darkness even hired producer Roy Thomas Baker, the man behind numerous Queen records, as well as records by the Cars, Cheap Trick, Journey and Ozzy, to accentuate their change in sound. But don’t worry kids, the Darkness are still able retain the music they are known for. “Is it Me?” features some of the best guitar work the Darkness have recorded; and also finds a steady balance between their pop-metal leanings and their multi-tracked theatrical background vocals. As good as “Is It Me?” is, “Bald” is really where the rock is found on One Way Ticket. The lyrics of “Bald” are amusing, but take a guess what they’re about. However, they do not steal the fact that the music behind them is perhaps the hardest the band have ever produced. The finest moment in “Bald” is at the about the 4:22 mark, where the build-up to the final chorus is, for lack of a more adequate word to describe the level of sound, incredible. The most important difference, and the difference which really separates One Way Ticketfrom Permission to Land, is that One Way Ticket contains a couple of, well … simply not that good songs. “Knockers” and “Girlfriend” are both pretty bland, run of the mill Darkness songs. Although “Girlfriend” is almost saved from being average, by the ridiculous falsetto of lead singer Justin Hawkins reaches in the chorus. The orchestral “Seemed Like A Good Idea at the Time” strives for a “November Rain” level but falls short of reaching that mark.